All winter long I have been chainsawing ash trees that had been standing, dead from the monstrous chewing of emerald ash borers, for about five years. It has been a sad but necessary chore. 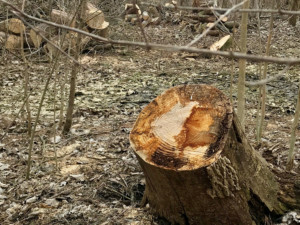 A severe windstorm, which gusted to 65 mph about a month ago, brought down a slew of the remaining deadwoods in Froggy Bottom, and close to the homestead alone I had six trees to cut up for firewood – now and for next winter. I want to get the cutting and wheelbarrow-hauling, to my woodpile, done before spring greening impedes access to the timber with the vines, thorns, and poison ivy that is part and parcel of a creek bottom left natural. Ash is such a nice wood. It has given us all manner of fine lumber, from cabin-framing to baseball bats and so much more. Each time this winter that I dropped an axe-maul on a log, the revealed splits showed such lovely, straight grain – the outer sub-bark surfaces of each log showing the curlycue tracings of the boring insect pests. But oh, how ash cooperates with wood heat, and while not the equal of seasoned oak or hickory, it provides solidly moderate amounts of BTUs per split. It splits nicely, even burns “green” if needed. I much rather would have the many ashes around my bailiwick – including an 88-year-old grandparent tree that stood on the ditchside cornfield just down the road – still alive and well. Alas, it is not to be. The mature ones all are dead and most are down. So I guess I am resigned to be grateful for the stove-heat that each one now provides my little red house on the (former) prairie, and for the previous day’s wood-ash that will mix with fallen, rotting leaves and vegetable scraps on my mulch windrow. Recently, my son Andy, who has assumed most of the heavy-lifting in terms of land management of our creek bottom – wildlife habitat being the primary goal – cleared large expanses of pestiferous bush honeysuckle. This is the most monstrous invader I have seen in 45 years on Froggy Bottom, save for those emerald ash-killing borers. His cuttings and brushpile-building revealed that many ash saplings have re-sprouted. Some have reached 20 feet tall, wrist-thick, or more. Many were hidden in bush honeysuckle thickets. Alas, somehow, even though the borers have ravaged the creek bottom’s former ash stands and moved on, enough of them remain to re-infect and eventually kill even these trees. But – and life is lived after the “but” – the odd ash tree has genes resistant to emerald ash borers, fully or at least partially so. Federal forest researchers know this and have established a registry for landowners to report survivor ash trees. I wrote about this project, centered at the U.S. Forest Service Northeastern Research Station in Delaware, Ohio, two winters ago. It still is alive and working for a way to propagate borer-resistant ash. The station wants to hear about apparently healthy ash trees in the 8- to 10-inch-diameter size. Click here to access the website. “There is some hope,” said Dr. Kathleen Knight, a forest ecologist at Delaware. She spoke of some promising developments – one can hope. Knight said that the aforementioned website is being revamped, so a telephone inquiry might be the best way to start at this point. Call the Delaware research unit at 740-368-0140. On a walking survey of son Andy’s recent bush-honeysuckle clearings, I noticed a pair of ash trees, perhaps 20 feet tall, about 10 feet apart, wrist thick. They looked like twins, though one clearly was “sick” and showing signs of borer infection. The other? Not so sure. So I will keep patrolling my creek bottom and searching, searching, searching – and hoping I will find one of those magical trees genetically blessed to resist an insect monster.